In Fad-Free Nutrition, exclusively on CNN.com, the editors of Cooking Light help you digest the latest diet and food news and trends. Pistachios, pecans, hazelnuts, almonds, and others can be made into tasty spreads and put in recipes. While consuming with caution is always prudent, it's important not to give up on nuts and peanuts (which are actually legumes) entirely. They offer numerous health benefits and can even help dieters stay on track. Consuming just one ounce of nuts -- of any variety -- up to five times a week in place of other calories consumed is likely to help reduce the risk of heart disease. Although nuts are high in calories, they contain heart-healthy mono- and polyunsaturated fats, and they're jam-packed with nutrients such as vitamin E, folate, niacin, copper, magnesium, and potassium. Plus, they have some protein and fiber to help keep you feeling satisfied. 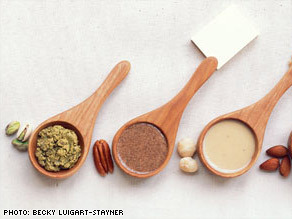 Learn more about the health benefits of nuts (plus recipes that use them) at CookingLight.com. 1. Make your own spread. Although major national brands of jarred peanut butter have not been recalled, it's a fun and nutritious option to make your own. At certain grocery stores, such as some locations of Whole Foods Market, you can grind peanuts to make fresh peanut butter. In less than one minute, you have a fresh, peanutty spread without preservatives or added sugar. You can also make fresh peanut butter at home; all you need are plain roasted peanuts and a food processor. Put ¾ cup plain roasted peanuts in a food processor; process two minutes or until smooth. See our staff's tips on making homemade nut butters on our blog, Test Kitchen Secrets. 2. Get creative. Use fresh peanut butter to upgrade homemade versions of snacks that may have been recalled. For example, spread a teaspoon of peanut butter on a whole-grain cracker instead of purchasing ready-made peanut butter crackers. You might surprise yourself by creating a better-for-you treat, such as our lightened peanut buttery Swag Bars. Visit CookingLight.com to learn more about other nutritious nut butters made from cashews, almonds, macadamia nuts, hazelnuts, pecans, pistachios, and walnuts -- including how to make them, and healthful recipes that put them to delicious use.